Art transportation is a complicated process that requires much skill, experience, and certainly attention to detail. Moreover, a reliable art moving company should provide a full range of services related to shipping fine art, including a professional crating service, which is crucial when transporting valuable and fragile objects of any type. After all, while proper packing is essential, it is not enough to ensure your precious possessions are fully protected in transit. Only high-quality wooden crates can guarantee that everything arrives at the destination intact. Fine Art Shippers has long been known for providing a comprehensive art crating service of the highest quality. Furthermore, our team of experienced crate makers is proficient in building custom wooden crates for any kind of art, be it a large painting, a massive outdoor sculpture, or anything in between. This allows us to provide our exceptional fine art crating service to galleries, museums, auction houses, artists, and collectors from around the United States and beyond. Besides, our team has extensive experience in packing and crating various items on-site at our clients’ facilities, as well as we can arrange pick-up for the full crating service at our own warehouses located in Brooklyn, NYC and Elizabeth, NJ. 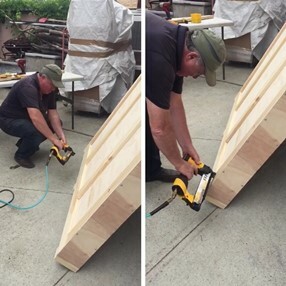 In the video below, you can see an example of a custom wooden crate made using a special nail gun, which is a very good tool for not splitting the wood. Besides, it allows building high-quality and reliable wooden crates that additionally look presentable. From the most delicate art pieces, antiques, and glass objects to luxury furniture, grand pianos, and heavy equipment, we know how to build a custom wooden crate for literally any item, no matter its size, weight, and shape. Besides, we always pay particular attention to the shipping requirements of each transported object to ensure that our crate is able to provide it with the utmost care and protection during the entire process of transportation. It is no wonder that Fine Art Shippers is considered one of the best wooden crates manufacturers in NYC, offering a professional fine art crating service at a reasonable price. Thereby, whether you are shipping a painting, an art installation, or an antique sculpture of any size, do not hesitate to contact our team for professional packing and crating services! We will do our best to ensure your treasures are delivered to the destination safe and sound!